This study day explores issues raised by major Roy Lichtenstein retrospective at Tate Modern. The Oxford English Dictionary defines ‘cliché’, in the first instance, as ‘a metal casting of type’, and, in the second instance, as ‘a hackneyed phrase of opinion’. Both these registers of the cliché, the technical and the rhetorical, are very pertinent to the art of Lichtenstein. Professor Hal Foster is Townsend Martin Professor of Art & Architecture at Princeton, Co-editor of October magazine, and author of numerous books including The First Pop Age: Painting and Subjectivity in the Art of Hamilton, Lichtenstein, Warhol, Richter, and Ruscha, 2011. Princeton University Press. Part 3: Introduction to Tate Modern exhibition project. Iria Candela is Co-curator of Lichtenstein: A Retrospective at Tate Modern. Embedded in English Pop-related art in the 60s, was a project which might be described as ‘popular modernisation, with English characteristics’. These thematics include whimsy, satire and abjection – standing in marked contrast to US Pop. Mellor will look at the work of Nicholas Ferguson, Derek Boshier and Bruce Lacey. David Alan Mellor writes on 20th-century painting, photography and film, as well as curating exhibitions; most recently including, The Ebb-Tide (with Mike Nelson), University of Sussex Library, 2012; The Bruce Lacey Experience (with Jeremy Deller), Camden Art Centre, 2012 and Radical Bloomsbury, Brighton Pavilion and Art Gallery, 2011. He teaches at The University of Sussex. Exploring pop art in Britain and the end of empire, this presentation will assess the role of the RCA-graduated, Guyana-born painter Frank Bowling in shaping a ‘decolonised’ history of art. It will draw attention to the links between this country’s changing global status during the post-war period and its strategies for celebrating British art. Leon Wainwright is Lecturer in Art History at The Open University. He is the author of Timed Out: Art and the Transnational Caribbean (Manchester, 2011) and together with Charles Harrison and Paul Wood, co-editor of the forthcoming volume Art in Theory: An Anthology of Changing Ideas (Wiley Blackwell). In 2012 he was awarded a Philip Leverhulme Prize in the History of Art. Pop Goes the Easel emerged from the creative encounter between Russell’s interests and opportunities at BBC’s arts series Monitor, on the one hand, and the example of a cohort of Royal College painters – in effect his collaborators – on the other. This paper offers a brief account of the film and its controversial reception. Lisa Tickner is Visiting Professor at the Courtauld Institute of Art where she teaches an MA in British Modernism. She is the author of four books and numerous articles on aspects of nineteenth- and twentieth-century art history and visual culture. Her interest in Pop Goes the Easel relates to her current research on the London art world in the 1960s. Part 8: Gavin Turk, Whaam! The effect and impact of Lichtenstein’s work on Gavin Turk. In this presentation Turk will also reflect on his approach to art making that deals with the cult of personality and the construction of artistic myth, drawing on the themes of identity and parody in Lichtenstein’s work. Gavin Turk is a British born, international artist. His installations and sculptures deal with issues of authorship, authenticity and identity. Concerned with the ‘myth’ of the artist and the ‘authorship’ of a work, Turk’s engagement with this modernist, avant-garde debate stretches back to the readymades of Marcel Duchamp. He has exhibited in many major galleries and museums throughout the world. Turk has recently been commissioned to make several public sculptures including Nail, a 12-metre sculpture at One New Change, next to St Paul’s cathedral in London. In 2013 a major new book assembled under Turk’s direction will be published by Prestel, showcasing more than two decades of work. 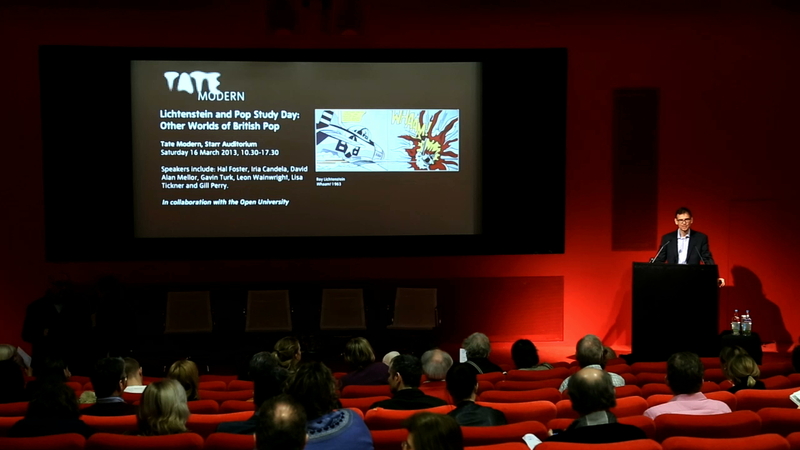 Part 9: Q&A session chaired by Marko Daniel, Convenor of Adult Programmes at Tate. Lichtenstein’s extraordinary body of work is the springboard for a critical exploration of ideas around the meaning of pop in the US and UK and its legacy for contemporary art and culture. Curators, academics and artists contribute to the debates. Speakers include: Hal Foster, art critic and historian, Iria Candela, Co-curator Lichtenstein: A Retrospective, Tate Modern, David Mellor, University of Sussex, Gavin Turk, artist, Leon Wainwright and Lisa Tickner, art historians. Question and answer sessions are chaired by Gill Perry, Open University and Marko Daniel, Tate.